Many of the bases found on the high street today are quite simply not fit-for-purpose because they’re either not heavy enough or are poorly made. This is not the case with ours. And this base is a very good example of this. Moulded from industrial strength poly-concrete in a pleasing octagonal shape it is heavy enough to keep the heaviest of parasols in place and upright regardless of the elements. The upright steel tube is finished in the same colour as the base and can be unscrewed for easy storage purposes. 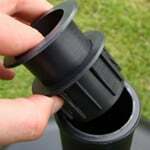 A tough plastic reducer is also included meaning it is suitable for a 38, 48 and 58mm diameter pole and this comes complete with a screw fixing on the side. The non-chip, smooth finish makes the base virtually maintenance-free and suitable to be left outside all year round. Good quality parasol base, it looks nice too. Well packaged and fast delivery, with excellent customer service from the delivery guy. This is a great place to shop from too, they have things in stock where a lot of others were sold out of things. My only 'bug-bear' is it went down in price just after I ordered it! so I paid a little more than 39.99 for mine, but hey, its worth every penny and I'm happy to have it. There was no problem with the product, but I have had to order a heavier base for the parasol (Hanson 300) I have, even though the garden centre where I purchased the parasol recommended a 15kg base and they were the only ones they sold. I now feel I need larger than 32kg as the parasol fell over in light wind on the 32. Otherwise an excellent product. Good bases, do exactly what I needed. Brilliant service great driver very helpful. Arrived around the date of the early estimate. Courier checked item for damage because they have had a series of breakages with this type of item but this was in perfect condition.